Replacement digital 4 RPM circuit board / control panel for most Breckwell pellet stoves made before 2002. Fits the following Breckwell pellet stove models IF you currently have a digital circuit panel installed. P23 Sonora - up to serial # 7165 (Some older models may have a A-E-101) P23I Sonora Insert - up to serial # 2242 (Some older models may have a A-E-101) P24 - up to serial # 53663 P24I - up to serial # 53794 P2000 Tahoe - up to serial # 11779 P2000I Tahoe Insert - up to serial # 22207 P2700 Mojave - up to serial # 8444 P20 Cadet (If you have upgraded to a digital board) P26 Cadet (If you have upgraded to a digital board) P32i Cadet (If you have upgraded to a digital board). Please Note that serial numbers are approximate and should not be the only source of validation for the part. Serial numbers may be off by as much as 10 units either way. 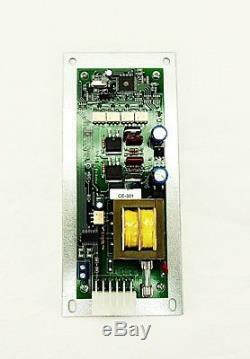 If your serial number is higher than those listed above, then you will need the A-E-401 Control Board - Please message us or see our other listings. If you currently have an analog/turn knob board, then you need a A-E-950KIT Control Panel Upgrade Kit. This is a special order part for us. Please message us for assistance. 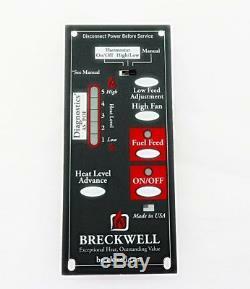 Genuine Breckwell OEM Replacement Circuit Control Board. Guaranteed Newest Stock and Latest Inventory. Please ensure you require a control board prior to ordering. Over 25 years of trusted value and commitment to our customers. The item "BRECKWELL Pellet Stove Circuit Control Board, 4RPM Motor Stoves, C-E-301 A-E-301" is in sale since Thursday, October 12, 2017. This item is in the category "Home & Garden\Home Improvement\Heating, Cooling & Air\Fireplaces & Stoves\Replacement Parts".